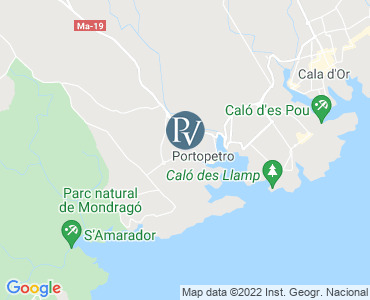 Villa Mondrago is a 3 bedroom Premier Villa located in a quiet area tree lined avenue within a few minutes walk to the pretty fishing village and natural harbour of Porto Petro, lined with yachts and local fishing vessels. Flanked by pine clad hillsides, the marina has fishermen's stone cottages and excellent waterside tapas bars and restaurants. The nearby Mondrago National Park is a nature lovers paradise with trails winding through pine woods. Two twin bedrooms share one full family shower room and there are patio doors to the furnished upper sun terrace. One of the twin bedrooms can be made into a double if required. There is a very friendly and helpful diving school nearby. For boat trips along the local coast and coves the "Can Capi" is an excellent choice and the captain Sebastian always ensures you have a good trip. The beautiful sandy beach s'Amarador is within a few minutes’ drive, or visit the Mondrago National park, which is ideal for walking trails through the pine woods. Porto Petro is a pretty little fishing port nestling between Cala d’Or and the Parc Natural de Mondrago. It has some great restaurants and chill out bars on the waterfront overlooking the yachts in the harbour. The closest coves have all but been swallowed up by the impressive Hotel Blau, but you are absolutely spoilt with the stunning neighbouring coves of Cala Mondrago and s'Amarador, which is our pick of the bunch for its breathtaking natural beauty. There is also Cala Sanau that has a great beach bar and beautiful clear waters so is definitely worth a visit. The Vall d’Or Golf Course is also within 10 minutes drive, which is not only a great golf course, but also has a lovely restaurant if you fancy some lunch in the beautiful grounds. The impressive mountain top peaks occupied by the Castell de Santuiri and the monastery Sant Salvador set the backdrop for much of the surrounding countryside, and quickly become familiar. You are also within a short drive to many interesting towns such as Santanyi, which has a great market on Wednesdays and Saturdays, and then there is Porto Colom, a picturesque fishing town that has some stylish new restaurants and bars.